Sometimes images are stronger in sets. 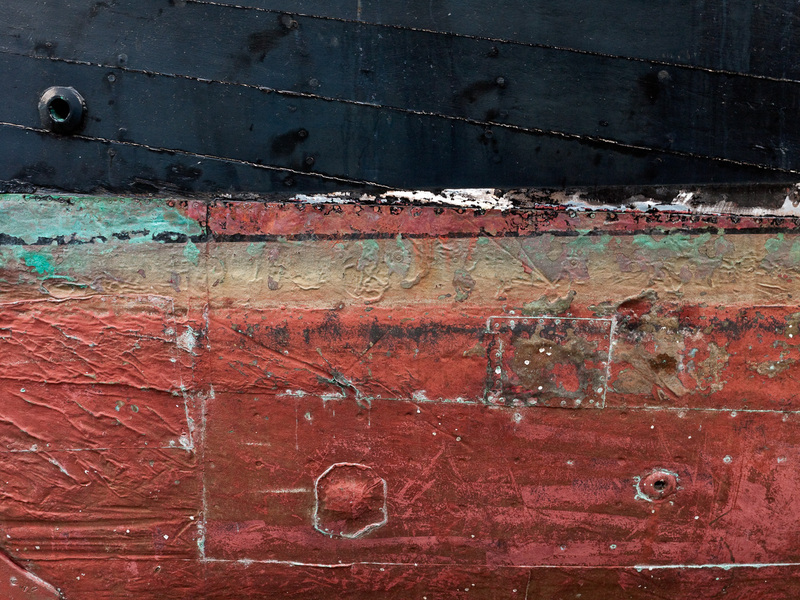 These three images are from the same tugboat, either decommissioned or awaiting repair, in Belfast, Maine. My wife and I were in Belfast to join the Wanderbird for a week-long cruise of the Maine Islands in 2010. I say cruise, but the Wanderbird was not your typical cruise ship. She was a 90-foot, former Dutch fishing vessel that accommodated 10-12 guests in small, but cozy cabins in the converted fish hold! Captains Rick and Karen both came from Maine coast fishing families. The Wanderbird was their way to stay connected with the sea, without the vagaries of the fishing life. They ran “expedition cruises” from the Caribbean to the Arctic each year. On some of the longer legs of their travels (from Labrador to Greenland, for example) the “guests” were expected to help crew as well. Back to the pictures. 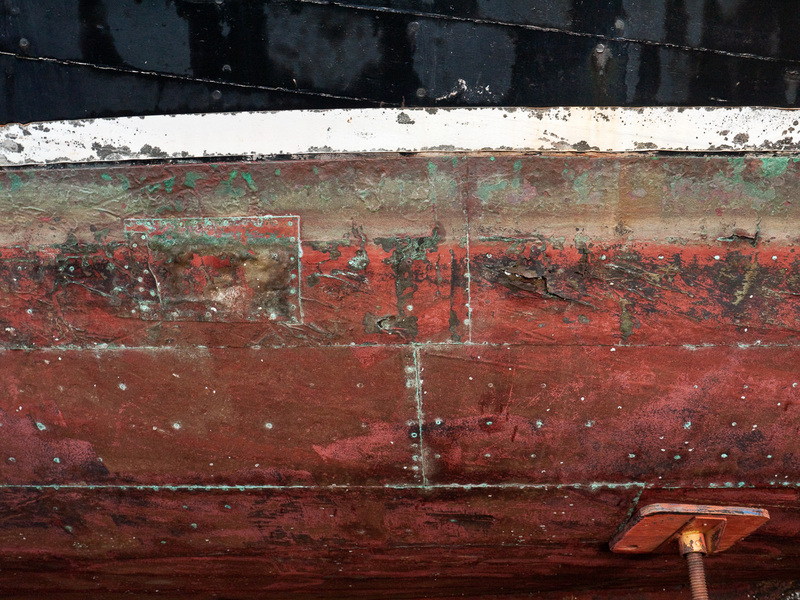 I was (of course) drawn to the tug by the incredible variety of scars, patches, and the remains of many paint jobs. 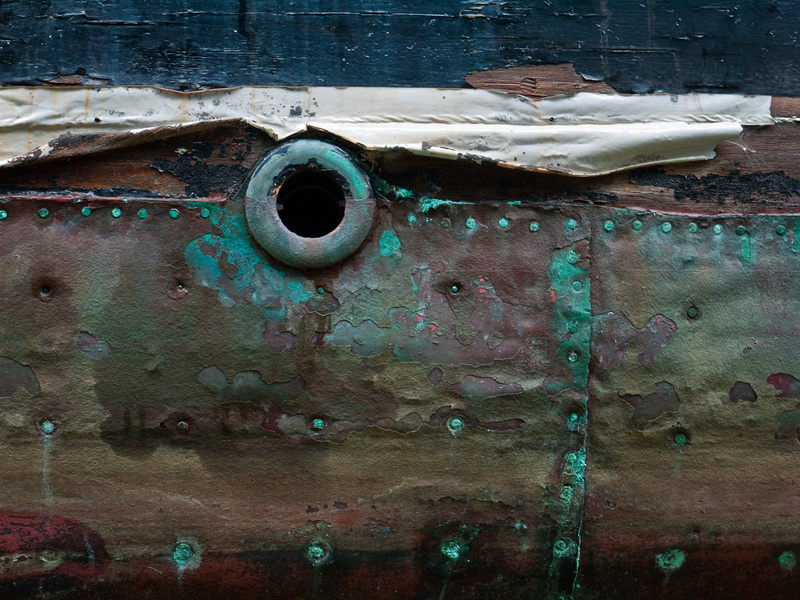 What a story that hull could tell if it could only speak. The light was dim and I was thankful for the image stabilization on the lens, because the exposures were handheld, and as long as 1/10th second. It’s amazing I got anything worth sharing.